Wanting to start a business of your own very soon but still don’t know how to go about it? Looking for some inspirational advice from your seniors? If the answer is a yes, then this post will definitely help you. Today we are going to enlist some of the best business coaches of the world who will not just motivate and inspire you but also give you all the inspirational ted talks that you need in order to have a start up of your own. So keep reading to find out! To those who want to become the richest entrepreneurs in the world, Margaret Hefferan is your girl. She is not just a leader but also a CEO for 5 different business organizations today. Margaret is also a very open and honest person and loves to inspire people through her messages. She teaches you to become a good entrepreneur, to deal with cultural conflicts in society, to work fearlessly and stay strong always. She also has spoken about her secret weapon to success in a speech called dare to disagree. You should definitely check that one out. So what makes you get up in the morning every day? Is it money? Or the fame? Or is there some inherent drive inside you that pushes you to work harder… a drive that you just cannot control. In Tony Robbin’s popular and classic speech which has more than 3 million views so far, you will learn some serious things that will inspire and motivate to push yourself further. This business coach is no joke at all! He will teach you some great things about having your own start up and we promise it is worth the view. Robbins has also explained how we can understand the needs of people and how someone else can change the way we think. He gives you great ideas that help you excel in your field and become a winner. A fourth entrepreneur who has been an inspiration to us in the past few years in Jason Fried. He is a software entrepreneur and has recently given a beautiful speech on why cant people get their work done at work itself. Here he talks about his business and how businesses often end up buying space that leave people with no work done in the office. Jason also speaks about some basic problems, digs deep into it and helps you come up with a solution. He gives you easy ideas that you can implement and make life easy in the future. Seth Godin is not just a business coach but also a life coach. He is a marketing expert and a best selling author who can change your life like no other. Most of his books have become a huge success, primarily because of the ideas he has enlisted in then. He will highlight some the best things you have ever heard and will definitely help you climb the stairs of success. Richard Branson is a must for those who want to become successful entrepreneurs some day. This guy is more action and less talk. He teaches you how to become successful in the business, how to fight learning disabilities and keep believing in what they want to do. He believes that we all can do something if we set our goals accordingly. The billionaire today speaks about his struggles, his failures, almost reaching prison experiences and a lot more. Richard Branson is certainly a great inspiration to the world today and someone you must listen to. One of the best speakers all over the world has to be none other than Simon Sinek. This guy has all the great ideas in mind that can help you become the best business man in the world. Not only does he discus business like a pro but also tells you about the core of it. He tells you how you should get up and simply do what your heart tells without falling behind. Simon always does a great job in telling us about the patterns of success with the help of examples that are inspirational and that help us change our lives and our philosophy. If you start reading his works and watch more of his videos, you will never have to look back. Joseph Pine’s speech on what consumers what is something we would request you to listen to as entrepreneurs. This guy has really changed the world with his messages and we bet he will change yours as well. He gives you a brilliant overview of the evolution of our current economy and discusses all those things that customers care about. Pine also gives you great insights on how you can come across as more authentic to the customers. David S Rose and his speech on how to reach more capitalists is an excellent speech that will definitely get you going. David happens to be a great capital raiser and at this point he is very much successful in his business. Not only has he invested millions of dollars but has got double in return and that is because of his smart thinking and even smarter investments. So if you want someone to help you in the field of capitals, then David S Rose and his 2008 speech is the best thing ever. Another guy to help you in the business is none other than Dan Pink. He came up with a video in 2009 that inspired a large number of people. He spoke about how you can motivate people on a daily basis and how that can help you. The business coach also gives you a few scientific methods to explain and uses the traditional reward system so that you can understand this better. He puts some light on some serious issues that will definitely show you some real great ideas and inspire you to start your own business soon. Malcom Gladwell happens to be an author as well as a thinker and a journalist who will teach you not just about business but also about food. He has written several books and has come up with so many speeches you will absolutely love hearing. His talks are related to the food industry and will definitely help those who are looking to have a business of their own. You should really try him if you want business. Unilever including 400 other brands had once upon a time hired some really good and efficient engineers who can help them come up with a nozzle that will perfectly squirt out the detergent for laundry purposes. Nobody got it right which is why they tried the method of trial and error. They also tried several variations one by one and 45 generations later Unilever came up with a laundry detergent and they have no clue why it works so well. Tim Harford is one of those guys who will give you inspirational talks and ideas like these that will blow your mind. He will teach you that its okay to make mistakes as far you stand up and fight for yourself. If you want someone who can help you become an entrepreneur as well as a good parent, Cameron Herold is your guy. This chap thinks that giving children weekly allowances is a bad thing to do and that allowances don’t make any sense to him. He believes in making them do some work after which they get paid for it. During his TED Talks, he has also spoken about a new kind of parenting that will help your start up flourish and boost your children’s education at the same time. Now isnt that a good thing! The guy has been building several businesses all over the world. Kelly McGonical is a health psychologist who can help you fight stress and work towards your big dream. She speaks on how combating stress can help us become the real hero we always wanted to. She also gives you a few tips and some of her secrets that will help all entrepreneurs stay calm and healthy. You will learn to change your body in a positive way through her advice and make stress your closest friend. Steve Johnson has also given us some awesome and motivational speeches that will undoubtedly change the way you think forever. They will inspire you to become different people and start our own business soon. He has written several books that have become quite a success and we would suggest you top read at least one of them. You will absolutely love this guy and his books! All these videos should not be watched only once. They are valuable and should be visited a few more times so that you as a future business man and an entrepreneur are able to deal with life in the right way and become successful in no matter what field you are choosing. Plus you may also share all of these ideas with your friends and we are hoping it will serve you really well. 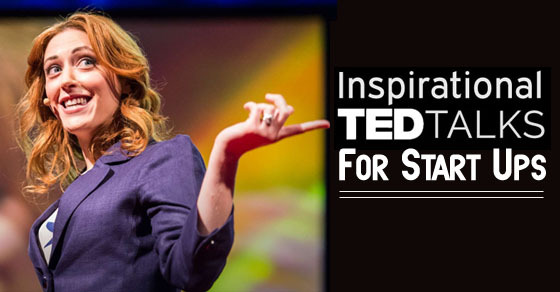 Now that we are done with this section, lets move on to some other TED talks that will help you in your own start up! With that, we would like to bring the post to an end. Yes! It is not easy to start a business of your own but if you give in your best, good results will definitely come you way. So check out all these brilliant speeches and get on with your plan. In case you have liked our post and found some help, share it with your friends and leave us some of your positive feedback below. Also your questions are very much appreciated. Let us know your opinions soon! Till then, take care!